BJP chief Amit Shah on Sunday ridiculed Rahul Gandhi for deciding to contest from Wayanad Lok Sabha seat besides Amethi, saying the Congress president has "fled" to Kerala fearing that the voters in his traditional stronghold would seek an account of work done by him and his party over the years. Shah was addressing his first election meeting in western Uttar Pradesh, where voting will be held in the first phase on April 11. The saffron party had won all the eight seats in the region in the 2014 Lok Sabha polls. "Rahul Gandhi has fled to Kerala as he fears that Amethi voters will seek an account (of work) from him," the BJP chief said. "In Kerala, there is politics of appeasement, hence he is going there. You (Gandhi) have played with the security of the country for your vote-bank politics. Wherever you go, the people of the country will ask you to give an account (of work)," he said. The Congress had earlier on Sunday said Rahul Gandhi will contest from Wayanad Lok Sabha constituency in Kerala besides his traditional stronghold of Amethi in Uttar Pradesh. The decision is seen as an attempt by the Congress to consolidate its electoral base in south India, especially Kerala which has 20 Lok Sabha seats. Shah also hit out at the Congress, claiming it "gave a clean chit" to Pakistan-based terror outfit Lashkar-e-Taiba in the Samjhauta Express train blast case, sent Swami Aseemanand and other "innocent people" to jail and "put a tag of terrorism on Hindus". He claimed that in "the Samjhauta blast case, the then Union home minister P Chidambaram, Sushil Kumar Shinde and Rahul Gandhi had said in front of US officials that Lashkar-e-Taiba is not a threat, but people spreading Hindu terrorism are." "However, court has given a clean chit to Swami Aseemanand and other accused," Shah said. He alleged that the Congress had committed the sin of linking terrorism with religion and demanded Rahul Gandhi's apology to the country. "They have committed the sin of insulting the glorious Hindu community for their vote-bank politics. Can a Hindu ever be a terrorist? Is it possible that Rahul Gandhi does not know that we (Hindus) even feed wheat flour to ants? How can we kill people? Rahul Gandhi should apologise to the people of the country for this," the BJP chief said. Alleging the Congress had denied Dalit icon Bhimrao Ambedkar his due honour, Shah said, "I want to ask Rahul baba why your great-grandfather (Jawaharlal Nehru) stopped Bhimrao Ambedkar from going to Parliament? His picture was not installed in Parliament. Today you are quoting Ambedkar, but it is the Modi government which has honoured him." In a jibe at opposition parties, the BJP chief said they have united due to the fear of Modi. "By chanting 'Modi, Modi' people have made it clear that Modiji should become prime minister (again). But whom will the 'gathbandhan' (opposition alliance) project as prime minister? They do not have any 'neeti' (policy) or 'reeti' (manner). The fear of Modiji have united them," he said. 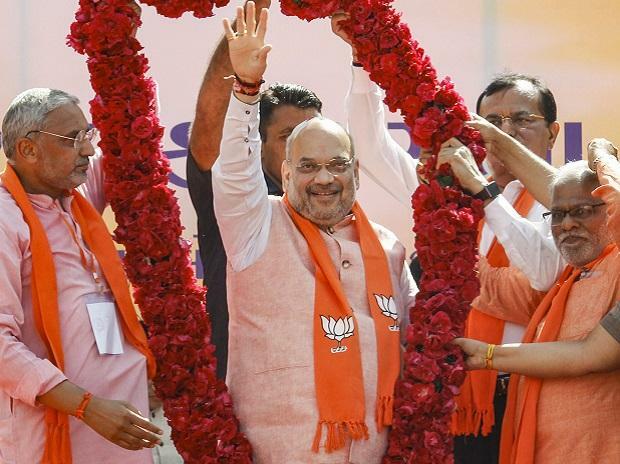 Citing various welfare schemes of the Centre, Shah said the Modi government has given gas cylinders, power connections and houses to the poor. "In the last five years, gas cylinders were given to seven crore poor women, 2.5 crore people got houses and nearly 2.35 crore families got electricity connections. Apart from this, 50 crore poor got the benefit of free treatment up to Rs 5 lakh," he said. Referring to PM Modi washing the feet of sanitation workers during Kumbh Mela in Allahabad, the BJP chief said, "This has not happened earlier. The prime minister honoured them and also sent a message of social harmony." Lauding Modi for the decision to carry out anti-terror air strikes in Pakistan's Balakot following the Pulwama terrorist attack, he said, "Pakistan killed 40 of our CRPF jawans. Modiji demolished the hideouts of the terrorists by conducting air strikes in Pakistan on the 13th day of their death." Later, at a rally in Baghpat, Shah said, "If they (Pakistan) fire bullets at us, we will reply with shells. If they hurl stones at us, we will reply with bricks." "The people of the country said Modiji has done a good by hitting terrorists. But Sam Pitroda, the guru of Rahul Gandhi, said the attack was not good and there should have been talks," he said. There was an atmosphere of festivity across the nation following the air strikes, but Rahul Gandhi, Mayawati and Akhilesh Yadav had a long face, the BJP chief claimed. Blaming the successive BSP and SP governments in UP for alleged non-payment of sugarcane dues to farmers, he said, "Our government has paid Rs 58,000 crore to sugarcane farmers. By April 5, almost 75 per cent of cane dues this year will be paid by the Centre and the UP government." Prior to beginning his speech in Baghpat, Shah paid tributes to former prime minister Chaudhary Charan Singh and said, "How we should work for farmers has been told to the country by Chaudhary Sahab." The Baghpat parliamentary constituency has been the traditional seat of the Chaudhary family. But in 2014, RLD's Ajit Singh lost the seat to the BJP. This time, his son Jayant Chaudhary is in the fray from the same seat. Taking a jibe at the father-son duo, Shah said, "If a record of non-performing MPs is to be made, then Ajit Singh and Jayant Chaudhary will be at first position. Ajit Singh fled to Muzaffarnagar from Baghpat to contest the polls fearing that he may lose the from his traditional seat.